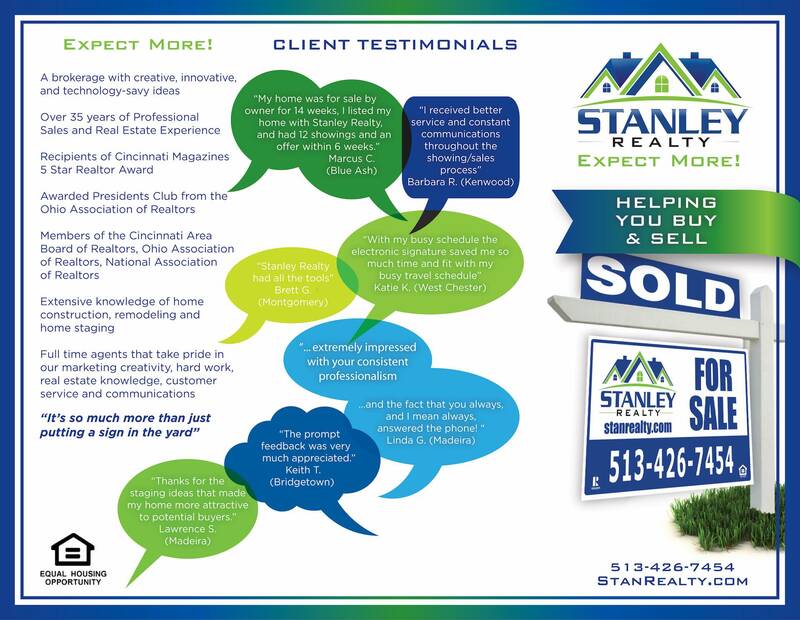 Cincinnati Real Estate Testimonials - Stan Realty - Expect More! My home was for sale by owner for 14 weeks, I listed my home with Stanley Realty and had 12 showings and an offer within 6 weeks. Thanks for the staging ideas that made my home more attractive to potential buyers. Stanley Realty had all the tools that the higher commissioned Real Estate companies have and much more. Loved the Sundae – Sunday! I received better service and constant communications throughout the showing / sales process. They showed me that selling my home goes beyond just putting a sign in the yard. I received a post card from yet another realtor wondering if I wanted to sell my home. I hesitated since I had received many over the past 22 years. For whatever reason I called Stanley Realty. After a short discussion, I said sure, go ahead and show my house. The rest is history. He showed my house three times and I knew I had to find somewhere to live quickly. I did and couldn’t be happier with my choice of realtors. I wanted to give you a quick note to thank you for all your help with the recent sale of my home. As I’ve already mentioned to you, I was extremely impressed with your consistent professionalism and the fact that you always (and I mean always) answered the phone! Your communication with me regarding showings and prompt feedback was very much appreciated. In our current market and economy it is very impressive that you had a contract on my home within three weeks of the listing date. We had 11 couples at our first Open House, love the GiGi’s Cup Cake idea. I would recommend SR to all my friends and family. I needed a handyman to complete some the staging ideas that Stanley Realty recommended, they also recommended the handyman! On the market 7 days and it SOLD. We encountered two difficult issues, one was appraisals and one with a shared driveway. Stanley Realty hooked us up with the right folks and made the closing happen….on time. Love SR.
Have you worked with us and want to share your own testimonial about the experience? Contact us here to provide it. We thank you in advance! Stanley Realty is a boutique full service residential real estate brokerage in Cincinnati, OH. Our motto is “Expect More”. “Expect More” from your real estate agent or realtor. Stanley Realty can help with all matters of Real Estate. Stanley Realty sponsors Bonfire on the Ballfield in Madeira. Such a wonderful family event!